Sears LocalAd #Sweeps - Enter to Win a $100 Gift Card! Do you shop at Sears? Sears is one of my favorite stores as they always have some of the highest quality brand names at great prices. I even remember my mom shopping through the Sears catalog and then we would pick up the items at the store when we went into town. However, as we both know, when you get to shop with money that isn’t coming out of your own pocket, it’s even better, right?! That’s why I’m hoping one of us wins a $100 Sears gift card in the @Sears LocalAd #Sweeps! I’d be putting it towards a new refrigerator that we desperately need. 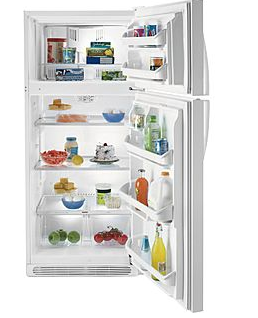 This refrigerator is so big and spacious – it would be perfect for all the fresh produce this spring and summer! Psst… you can also get 2 extra entries if you share the sweepstakes with your friends on Twitter and Facebook! If you win the Sears LocalAd sweepstakes, what will you spend your $100 Sears gift card on? « Kmart Local Ad #Sweeps – Enter to Win a $100 Gift Card!